On Friday/Saturday Joanne and I had a nice little get-away in Melbourne. The main reason we went to Mexico, was to go to a techno party on Friday night at QBH, featuring Steve Bug, Sven Vath and Gui Boratto [live]. It’s always fun to spend time in Melbourne, funky shops, great food, nice relaxed vibe, friendly people, and it’s lovely to catch up with our Melbourne friends. We got a really cheap, last minute, return air-fare and accomodation deal through VirginBlue, staying a night at the Jasper Hotel. It’s quite nice, It looks like an old hotel that’s had a trendy colourful make-over. We stayed on the lime green 8th floor, in room 808, how very techno! We were on the Queen Victoria Market facing side, so come Saturday morning we were woken by lots of noise from below. Paying extra for late check out, allowing for a sleep-in, was well worth it, we didn’t get in until near 6am after the party. We had some great food in Melbourne, as you do. We had excellent Japanese for lunch on Friday at the little hidden away gem, that is Yu-U. For dinner we ate at Bistro Vue at Vue De Monde and had delicious Jamon, Foie Gras and amazing Wagyu beef. On Sunday we caught up with friends and ate a late breakfast at one of our fave Brunswick Street, Fitroy cafes Babka Bakery Cafe. It’s always great to eat some yummy Trampoline gelato when in Melbourne too, such amazing flavours. Try the lickrish, and peanut nutter flavours, awesome! The lemon and pistachio are still my faves. I think I like this gelato even better than Adelaide’s Alfrescos gelato now. 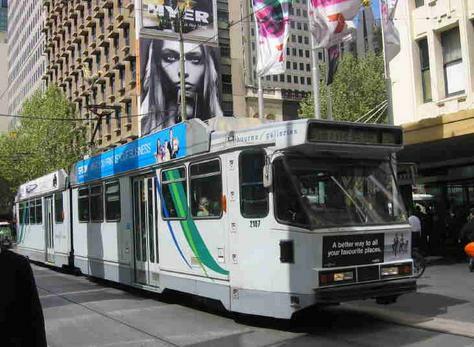 It’s fun in Melbourne to catch the trams around, a novelty for us Sydney folk, and check out all the groovy little shops in the arcades in the city, up and down Brunswick Street, Fitzroy, and in the massive Melbourne Central complex. I’ve missed checking out shops up/down around Chappel Street, and Greville Street Prahran/South Yarra the last few visits to Melbourne, must do that next time. Joanne scored some chocolates, jewellery and was very excited to find and buy an FM3 Buddha Machine (see my post about Robert Henke’s Layering Buddha below). I scored a couple of ubercoolische t-shirts, but failed again on finding any sneakers I like in Melbourne. On Saturday afternoon we got very distracted by all the amazing gormet foods in the Simon Johnson store. The 70% dark chocolate Chocolate Santander brand we got from there was awesome. Made for some intense dreams that night. I’ve been to Melbourne so many times now I’ve lost count. It’s always an enjoyable place to visit.